Hello Spartans! No ancient warrior is safe when a Spartan soldier is around, and neither is their empire! Many city-states underestimated the power of the Spartan army and they paid dearly for it with the lives of their own soldiers and their cities. Bummer, yeah? Nah, not when you become one of them! It’s no wonder that the Spartans have gained popularity once again amongst us modern folk longing for a day when heroics and traditions were taken seriously and where honor was the ultimate goal for any man of fighting age. And you don’t even have to go back in time to be a Spartan warrior – we’ve got you covered! You'll be able to rule the battlefield as one of the most feared ancient soldiers this Halloween season in this Spartan Warrior Costume! The costume includes a knee-length red cape that drapes over the shoulders and an antique-brass-tone plastic medallion that can be tied to one shoulder of the cape. The brown kilt has an elastic waist for a comfortable fit and has a front wrap panel and black and gold detailed edging. Adorning the costume is a belt and wrist cuffs made of faux brown leather and are embossed with a basket-weave pattern. Word to the wise, no warrior would dare go into battle without a helmet, so this costume comes with a molded vinyl headpiece that is painted to look battle-worn. 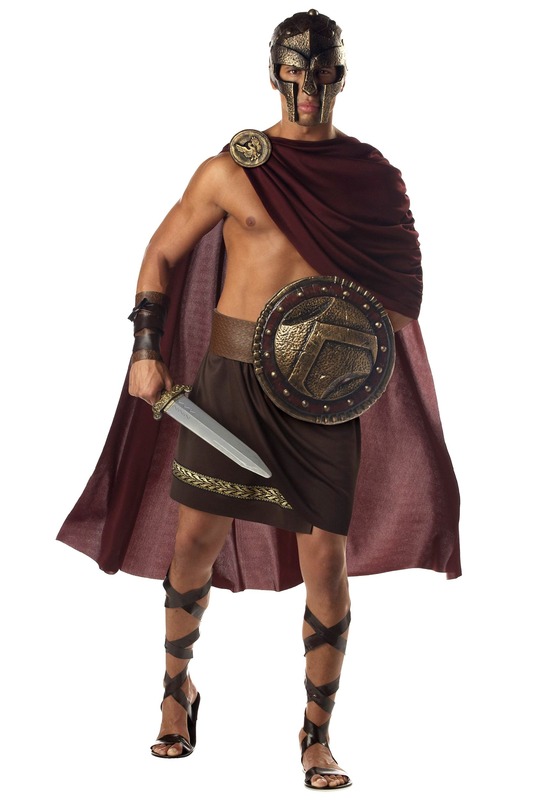 Add accessories like lace-up sandals, leg guards and our Spartan shield and sword for a complete look, and be sure to check out our women's ancient goddess costumes for your date. Onward to Sparta!